Bluewater Express - View timetables, Compare and book ferry tickets at directferries.ie. With a firm emphasis for safety, professionalism and guest satisfaction in all their services, Bluewater Express is known to be one of the best and most reliable ferry companies in the region. 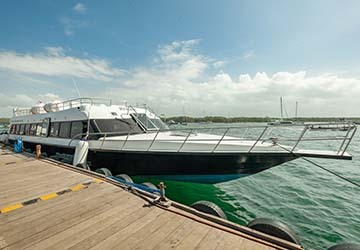 Established in 2005, the British owned Bluewater Express has 3 modern purpose built vessels. All of them launched in the late 2000s to early 2010s and are capable of carrying from 30 to 60 passengers. The ferries have been designed specifically to handle the waters between Bali and Lombok allowing you to sit comfortably throughout the journey. The transfers run numerous times daily, all year round and frequency increases in the peak season. Facilities on board are limited however a toilet, a spacious sun-deck are available, as well as bottled water and sweets which are provided free of charge. Morning coffee or tea is included in the ticket for passengers travelling from Serangan Harbour. The company also offers hotel pick up and drop offs with their vans to/from Serangan and Padang Bai in Bali making it even easier to travel to Lombok and Gili Islands. Transfers are available on request and need to be booked in advance. Use directferries.ie to find Bluewater Express timetables, prices and to book Bluewater Express ferry tickets. Looking for the lowest fares for your destination? Don’t worry, we’ll also compare Bluewater Express with alternative ferry companies.